Greetings dear friends on a beautiful Saturday evening. As Beth and I are preparing for our trip to Europe, I thought it’s a good time to share with all of you our travel plans for the year. Besides those listed in this poster, we are also exploring Berlin, Morocco and Korea. 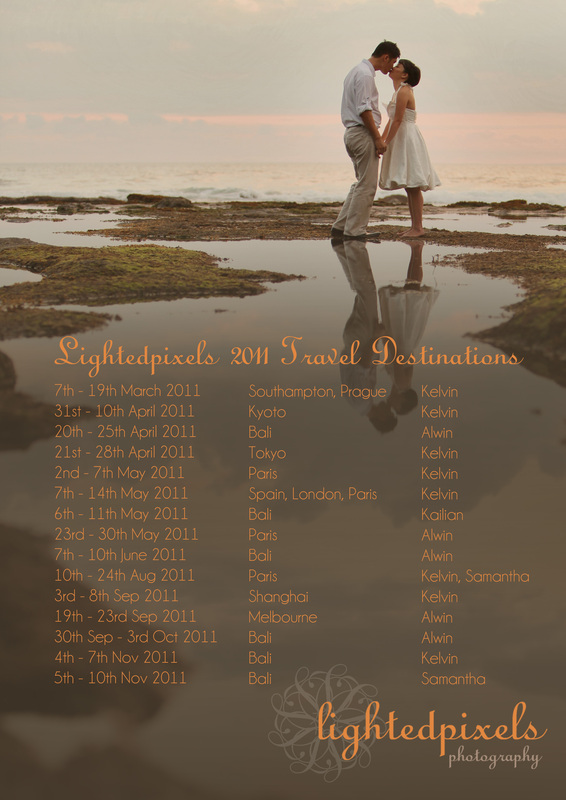 Do email us at info@lightedpixels.com for more information. Kailian and Samantha from the Pixies will also be traveling for shoots. Do email them at info@lightedpixelspixies.com. All our trips are packaged comprehensively. The destination shoots packages include makeup and hair services, the photographer’s airfare and accommodation, and in most cities, transport too. A number of the cities are also selling out fast so do email us early to book a place. We look forward to hearing from you guys!! =) And here’s looking forward to more awesome shoots this year! Meanwhile, Beth and I leave tomorrow and will be back in a couple of weeks. ~ by Kelvin on March 5, 2011.